The Blog What does procrastination look like? What does procrastination look like? You know how monsters lurk under the bed, in the dark? And you know how to get rid of them? Right. If you want to beat your procrastination monster, you need to get to know it. Know it really well. 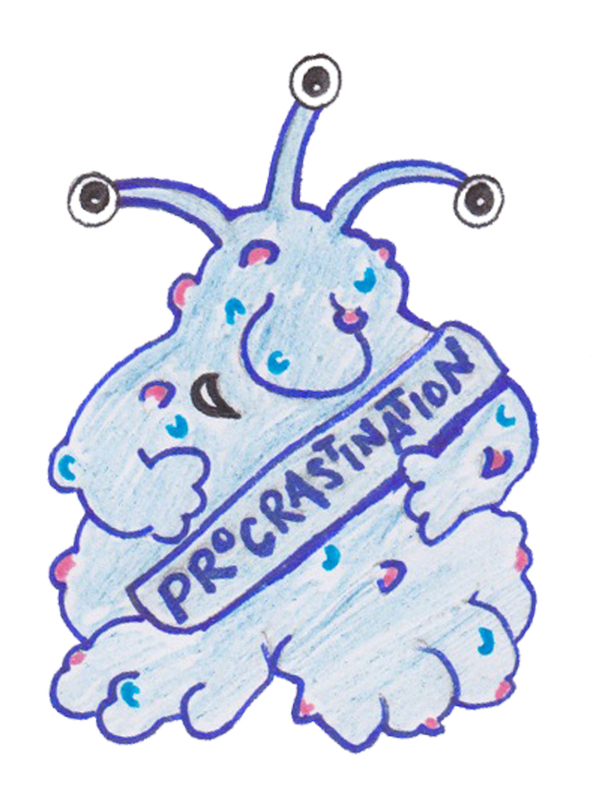 What does your procrastination monster look like? Where does it live? How? What does it feed on? What are it’s favourite tv programs? What are it’s hobbies? What are it’s fears? What dirty little secrets does it have? And so on. You can draw, write, do anything that might make this subject more fun than depressing. I would love to see some pictures of your monsters here. Blind them with all the light you shine on them! I agree, you need to know what you’re dealing with before you can figure out how to deal with it! When I try to change a habit, I first record the present habit and make a plan from that! Recording what you actually do is a great first step when you want to change something. And planning helps to stay on track. I often ask people to record their progress. Many people tend to look at the ‘fails’ and count those. They’ll notice the 1 out of 10 that they didn’t do, and don’t count or value the 9 that they did do. Mine usually looks like my to-do list with eyes. A long list of unfinished work chasing me around my house, that makes me less likely to want to try and tackle it. On the upside, I know that everything I cross off that list makes the monster smaller and smaller and easier to contend with. That sounds like a helpful image, that it grows smaller when you cross things off. To describe this, I thought about what are the causes, what does my monster feed on? Two answer immediately came to mind, accountability and necessity. There are projects I wish I could complete but there is no dire need to do so and so the project does not get done. the second is accountability, if I feel no one is waiting for me to complete something why do I need to rush to get it done. I am aware that I face these two challenges everyday and I believe it will always be a challenge that I will need to manage. I hardly believe in monsters disappearing, but I do believe in taming them, shrinking the, teaming up with them in a productive way, etc. I can’t figure out how to reply with a picture, but I was planning to use your inyourfacefrog as my monster. thanks for the provocative question, van Sons! Seems mine is a shapeshifter, changing with the particular category of task being avoided! Wish i had a few minutes to draw the first few out. I wish that too Patti! Can you make time? It might be fun!